1 First, we need to begin with the external symptoms, the loss of temper, the vengeful acts, because they do so much harm to us and to others, get us into so much trouble. We need to plan how to hold our temper, because anger is a quick acting demon. Adultery takes time to arrange. (I assume – I promise you and my wife that I don’t know anything about this!) But harsh words are often out of our mouth before we know it. John of the Ladder has a lot to say about anger; he must have dealt with many angry monks – or was it with himself? (All of Saint John’s quotes here are from The Ladder of Divine Ascent, Step 8.) He wrote, “The first step toward freedom from anger is to keep the lips silent when the heart is stirred.” Plan ahead so you will be ready to “sit on it”, keep your mouth shut. Keep in mind that the devil comes at us in many ways, especially when we are tired or under stress, so get your guard up. Plan so that when you feel anger coming on you will, for example, say the Jesus Prayer ten times before you speak. Plan so that if you are still not in control you will cast out the demon before he gets you again. 2 This suggestion may seem silly and somewhat impractical, but I think another plan would be to look into a mirror when you get angry. I’ve told you that on Mount Athos there are no mirrors lest the monks be tempted by vanity, but in this case this might help avert sin. This might work when you are at home and about to let loose at someone in your family: Quick! find a mirror and look at yourself – the bulging eyes, the distorted, misshapen face. Anger is so ugly. Do you really want people to remember you like that? Saint John of the Ladder says those overcome by anger look “pitiable”. 3 John also advises, “Singing in moderation can…ease a bad temper.” Or these days, listeningto music. It doesn’t have to be religious music. Whatever diverts our minds. When I get upset about something, I find pop music from when I was young helps settle me. Frank Sinatra?! Yes! God can work in mysterious ways. 4 I have another suggestion: Form the habit of good manners. It is wrong to call anyone “raca” or [ “x” ] even to oneself. The good habit of speaking and acting kindly to people can help control angry words and actions. 5 However it is even worse, for the angry person at least, to hold the anger inside and not deal with it. We need to get it out, do surgery on the soul-destroying cancer. Saint John of the Ladder makes what seems at first an odd suggestion: “I have seen people delivered from [anger] by the very fact that they had flared up and then poured out their long-stored grievance, and in addition they got from their offender either some reparation or some explanation for what had caused [it].Those who were silently harboring resentments…were it seems to me more to be pitied than the men prone to explosions of temper.” This sounds dangerous to me, but sometimes it might clear the air. Often people don’t know why we’re upset with them, and this would at least give us a chance to explain, and for them likewise to explain. However, I’d wait till you settle down emotionally before you speak up. “Controlled” anger can be useful, especially when we get mad at our children. In any event, don’t harbor anger. Let off steam somehow. Maybe get a punching bag and give it a good workout? Or write a letter or an e-mail to the person you’re mad at, and do not send it. Throw it away. Erase it. Do not send it. So far, we’ve looked at how to control the external symptoms of anger. Now let’s try to deal with the disease itself. What is causing your anger? 1 Pull back and think about it. The fathers speak of anger as a failure of rationality. Recall the causes of anger that we mentioned earlier. Don’t just be angry. Instead try to pull back and ask: Why am I angry? Then deal with that. Do this quickly, for anger builds on itself. Saint John Chrysostom wrote (I’ve forgotten where), “If you fail to master your anger on the first day, then on the next day and even sometimes for a whole year you will still be dragging it out. Anger causes us to suspect that words spoken in one sense were meant in another. And we will even do the same with gestures and every little thing.” Saint Paul advises, “Let not the sun go down on your wrath.” Ephesians 4:26 (I’m not sure I agree with this. Disagreements should be settled as soon as possible, but I think it is wisest not to try to do so till both of you have settled down emotionally.) Consider: Do I want to feel like this forever? this burning misery to go on unto ages of ages? That would be hell. Indeed, hell consists of being consumed by our anger and self-pity. 2 Try to redirect your anger. Like all sin, anger is something good twisted out of shape. Saint Paul said, “Our enemy…is not flesh and blood, but…spiritual powers of wickedness in high places.” Ephesians 6:12 Saint John Chrysostom wrote somewhere, “Be angry with the devil… This is why God has armed us with anger.” Turn your wrath upon Satan, the source of all evil. 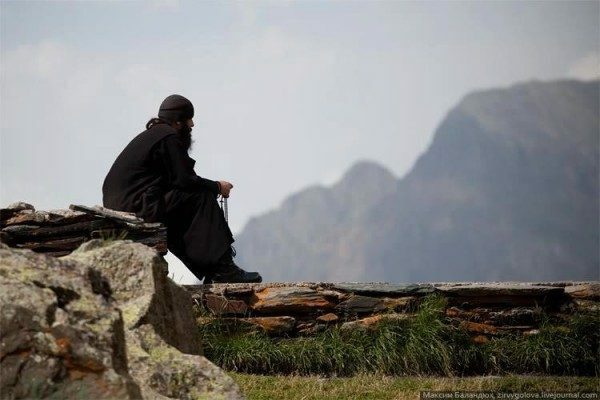 4 As always, to overcome any sin, it is a great help to go to Confession regularly and to have a spiritual guide, a competent and loving Orthodox spiritual father or mother, to help guide you. 6 C.S. Lewis says somewhere that while events cannot be changed, the meaning of events can be changed. For example, getting angry at your spouse is objectively bad, but it can lead either to evil (greater alienation, separation, divorce) or to good (increased understanding, forgiveness, deeper love, a better marriage) – depending on what you do with it. Whatever caused your anger and the fact that you were angry cannot be changed. If you nurse it, brood on it, wallow in it long enough and act on it, it can take you to hell. But if you allow God and his love into it, he can use that same event, that same anger, to help you understand yourself and others better, overcome sin, grow stronger spiritually, and change you into a more loving, more forgiving, better and holier person. That which once made you angry and threatened to send you to hell can lead you to heaven. If we let him, God can change the meaning of events, untwist them and turn them all into good – if not in this world, then in the next.And if you have faith that God can do that and will do that, what in the world do you have to be angry about? 1 Quick! tell God you’re sorry. 2 Soon, apologize to the person you got angry at. But, as I said before, wait till you and he or she have calmed down. If you do it too soon, you’re likely just to get into it again! Above all, do not assume the other person knows you’re sorry. Maybe they do and maybe they don’t. So get it out. Say it: “I’m sorry”. When you apologize, never ever try to justify yourself, even if you think there is some justification for your anger. Just say you’re sorry. 3 And as soon as you can, go to Confession. The nearest priest will do, and in this case you don’t have to confess all your sins; it’s ok to mention just this one episode, so you can get it out of the way fast, wipe it out, leave it behind. 4 If you regularly lose your temper or find yourself sulking or “nursing your grievances”, you need help. Go to your spiritual father or mother. If you don’t have one, try to find one. If you can’t find an experienced spiritual guide (and maybe even if you can), get a professional counselor. Find out what’s wrong inside you. Metropolitan Anthony (Pakanich) speaks on what dreams come true and why.